Homeowners know that water is important to maintaining a healthy lawn. During a time of drought, however, local water restrictions can make it difficult to water your lawn. In Austin, we are currently under an ‘extreme drought.’ You can find your watering schedule online here. Austinites can water their lawns once a week. What times of day can we water? Watering times are from 12:00 a.m. to 5:00 a.m. or 7:00 p.m. to 12:00 a.m. if you have an irrigation system and before 10 a.m. or after 7:00 p.m. if you have a hose-end sprinkler. Why these times? Well, they chose these times because the weather is cooler and there is less evaporation of the water. The folks who made the restrictions understand that your water can better penetrate the soil while the heat of day is not so prevalent. So how deep do you water the lawn? At Emerald Lawns, we still recommend that you water to a depth of 1 inch deep each time you are allowed to water your lawn. Watering deeply and infrequently can help you get through the drought much more easily. Your lawn has a better chance of surviving if you water deep so set your irrigation system accordingly. You can test it by placing tuna cans on several spots on the lawn. Set the irrigation system and check after 10 minutes or so to see how evenly the system is watering your lawn. If there are issues, make adjustments accordingly. The cans should be fairly even in their water distribution as a general rule. If at all possible, you should consider splitting the water times up. If you’re used to watering a total of 30 minutes per zone in your yard at 12:00 a.m., during a drought do 15 minutes per zone at midnight and start the cycle over again at 4:00 a.m. This will get you the most possible water for your time allotment. 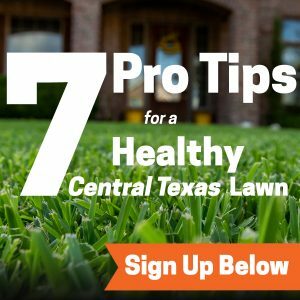 Are there other lawn recommendations we should be following? Set your mower to the highest setting. Mow less frequently and only enough to remove no more than one-third of the leaf blade at any given time. Taller grass will provide shade for the soil’s surface and the roots. Use low nitrogen or organic fertilizers like the ones we use at Emerald Lawns. We do this to give the lawn a good color and keep it drought tolerant without encouraging growth. If the soil is compacted, aerating the lawn is a good idea because it will significantly improve the efficiency of water moving into the soil’s surface. Ultimately, you’ll want to rid yourself of the fantasy of having a lush, green lawn during a significant drought. Your lawn may look a little less green, but it’s still healthy and it will bounce back as soon as the rains come again or the water restrictions are lifted. The best lawns are a little thirsty. Remember, a lawn can be hearty and withstand a drought if you take good care of it before, during and after the drought. Got more questions? Please feel free to ask them on our Facebook page. We’ll be happy to address any concerns you have there or just call us at 512-990-2199.